Michael Aspel invites the public to bring along their prized possessions for examination, this time at Woburn Abbey. A valuable portrait of a cat is among the finds. Browse content similar to Woburn Abbey. Check below for episodes and series from the same categories and more! Woburn Abbey stands in 3,000 acres of Bedfordshire countryside. all gathered during a family history which stretches back nearly 600 years. so for openers, allow me to take you on a grand tour of the estate. who left the building in his will to the first Earl of Bedford, John Russell, in 1547.
but it's been their postal address ever since then. Messrs Flitcroft and Holland, designers to the nobility. it's now only half its original size. succumbed to dry rot and eventually disappeared. including the Pere David, which originally came from the Imperial herd of China. and, in 1985, 22 were donated to the Chinese government. Woburn Abbey, like all grand and glamorous estates, earns its keep. In 1955 John, the 13th Duke, opened the estate to the public. and then, in the late 1960s, an antique centre was opened. Woburn means just one thing - the famous golf tournaments. For today's Roadshow, we're all off to the sculpture gallery. slightly overdressed for today's conditions - this hot sunshine. from Nagoya, Japan - any connection? I'd like to hope there is. to finish his education in Great Britain. -Give me a date for that. when Japan and Britain were allies. And had very close...close ties. -So, your father came to England - did he bring the doll with him? -Ah, there's more to this, is there? and he fell in love with this English lady - my mother. who was outraged that his eldest son was going to make a marriage in England. -go home and marry some...? He said, "Come home, or I will cut off your allowance". So, my very stubborn father said, "I'll get a job." but she died when she was nine, of meningitis. forgave his son and invited the whole family to Japan. and my mother meeting for the first time the Japanese family. Then the doll, you got in Japan? and he commissioned this doll to be made by the master doll-maker in Kyoto. which I always preferred to this rather pretty doll. -Yes, I would have been in your camp. -But she is just gorgeous. so we came back embarrassingly loaded with many, many, many boxes of gifts. How wonderful. A kimono like this? -My petticoat was the same golden orange colour. which was 1868 through to 1912. It almost has a feel and finish of porcelain. It's an incredible finish on the surface of the face, there. made as the full-sized costume would have been. -She really is the symbol of the family reunited, isn't she? but everything has a price. I would say that her value, to a collector, would be something around £1,000. Which, in the light of what it represents to your family, seems like a snip. -of periods and styles that we'd had from the Tudor period onwards. the period of shapes and designs up to 1760.
but with every revival there was always a difference. These enable you to tell, and obviously the value is considerable. and it came from France. and then revive again at the end of the century, when this was made. This is a Sheraton revival piece. rather than being set back. it looks more architectural, with this overhanging cornice. then you've got a pair of little inkwells, and the desk comes forward to write on. Now, before we go into it any further, tell me the family history. used to go to London on his horse and cart in the '20s and '30s. -And he used to buy furniture for his home. The earliest that we think that he bought it was probably in the late '30s, early '40s. -It's been in the family as long as my wife's been part of it. it works, it's smooth, and it's the most beautiful bit of wood. and its price when new, and this is all highly precision-made, with bright colours. and this would have been bright yellow, white, green, red. You can still see the colours. It must have been quite outstanding. -have you ever found a stamp on here anywhere - any of the drawers? -Ah, wonderful! Oh, that's great. Jewells of Holborn - that's fabulous! -It has an original plate in. Little Queen Street. Oh, this is great! -Gillows, Maples, Heals all sold Jewells furniture. -Wonderful. That adds considerably to its historic value and to its commercial value. and send it to the Victoria and Albert Museum. -Yes, because they like to keep a record of all stamped pieces of furniture. -That's a great find, a great find. as an academic piece and a historical piece of great interest. We're appreciating quality rather than just age. Every time I come on a programme, there's something new. Something we've never seen before, and something that stimulates you. I think it's a great object. -Do you know what it is? but that's a complete guess, really. So, how do you think it works? -but I'm not sure what the small holes are. -Now what do you do? Get a bit... Not being a man, it's not for me to guess. -is that what I do? -That's true. That's a good point. that they're not shaving bowls. And when you go back to the 17th and 18th century, men had beards. This is a beard washing bowl. -Right? That's what it's for. -and you hang it on the wall. ..and it's a very unusual one. flowers, baskets, something like that. This one has been moulded with these waves. -which is very, very uncommon. and they tried to repair it at the time. -It's not worked, because the crack has gone even further across there. Now, what date are we talking about? It's 300 years old. It's a really, really nice object. I love it. We have three of them. My parents actually have three of them. There must have been a barber's shop in the family. How wacky! -They inherited them, so I've no idea how they got hold of them. -is going to be worth close on £1,000. A perfect one I would think would be nearer £1,500 to £2,000. -Gosh. We'll check the others over. -Thank you for coming in with it. -It's to do with farming. -but it looks a bit too gruesome. -Bit dangerous for that, yes. -It's obviously for pulling something. -Put me out of my misery. Extend it into the middle of a hayrick, and you pull a piece out. -To see if it was damp, and then it would sweat. That's when it would catch fire. So, it's a tool that's used to gauge whether your hayricks are going to spontaneously combust or not? -Basically, yes. What age would it be? I might not have known what it is, but I can tell by the way it's made. The style of the case, and also the script on the sections themselves. I'm sure I wouldn't be far wrong. -Now, if you were in a darkened room, you would know that was a Ruskin vase. and the other thing is - go on, close your eyes, and then just feel from the top down. ..Yeah? -It goes from glossy to matte. -That is a good glaze. -I think my mice live in it. -How much rent do they pay? -So, this cost you nothing? It's probably worth, in the present market, between £300 and £500. Really? I shall have to start charging the mice rent, now. I bought this in the Caledonian Market, many, many years ago. I know nothing about it, but I've always wondered. and that's really all I... I've worked out. I think, in part, you're right. What we have here is a writing slope. for the British market, and probably made in India. It's a really beautiful visual object. you have this lovely, deep purple velvet slope. the colour will tell us the date, because this is a chemical dye. and the purple appears in about 1850, 1855.
so it's not cracked. It's not damaged in any way. to produce this incredible decoration over the whole box. and it is almost impossible to repair. -can you remember what you paid? -No, but it wouldn't have been very much. I think probably £10, something like that. Not more. has moved up to £1,500. -The problem with this book is that it's falling to pieces. Now, it's got a binding on it known as gutta-percha. and of course it ALWAYS falls apart. Every book that had gutta-percha falls apart. and all in fairly good condition. and use another form of glue and stick it all back together again. Lovely binding. A little bit of rubbing here and there. -Lovely copy, worth somewhere in the region of £500. -Now, this book here is a superb binding. Niger goatskin, red Niger goatskin with the royal coat of arms on it. I couldn't let it... I would have to mark it £200 at the very least. Designs For Household Furniture, by Chippendale. and this is all calf with little gilt fillets round the edge. It comes from the library of Archibald Philip, Earl of Rosebery. -You went to the sale? and I used to do all the carpet work and upholstery work there. I've been in the furnishing trade all my life. -You thought you'd like a pocket book. Lady Rosebery said I could pick something from the library. -She actually gave it to you? Because I helped them, getting the sale together, and she said I could have that. This is a first edition of the "Gentlemen and Cabinet-Makers Director". It is the most - one of the most famous books on furniture. In fact, I'm sure John Bly would be tickled pink to have a look at this. -We might show it to him later. It's all absolutely perfect and in absolutely superb condition. Normally, this book - because it is so large - is in appalling condition. But this is absolutely perfect, and in superb condition. -Well, I think it's the finest copy. I think £6,000. She gave you that and was very kind. She probably knew all about that. I could have had the Hepplewhite and Sheraton books as well, but I thought that would be greedy. You should have had them. Yes, absolutely. So, two scientific instruments, both apparently genuine. If I had to guess one was a fake, I would say that one. -new-looking scientific instrument. In fact, they're both fakes. was a sort of honest reproduction, really. it's got all the components on it that you'd expect. A little telescope, and things. -It's missing something in the quality. Exactly. It doesn't actually work. But it looks the part, and it comes in a nice little box. How much would you pay for that, if you were in the collecting mood? -I should think about £75 to £100. -Well, exactly, and these are being sold at £25. they're not stamped "reproduction", but they're bright and shiny, and they're being sold cheaply. This is, if you like, the dishonest reproduction. This is really a fake. It's been made to deceive, because the whole thing is a total fabrication. It's been put in this box that makes it look very old. and it's really pretending to be something old and wonderful. spent a little bit of time at Her Majesty's Pleasure. -So this is a criminal act? thought that they were buying the original 1581 object. And there's a market for these, otherwise they wouldn't bother to do this. but loads of people are interested in these scientific instruments. and so what they're producing is an honest reproduction, which is fine. I'm very happy with that today. What's to be done with the other nasty piece of work, as it were? I borrowed it from a private collection. It is in very safe hands. It will never escape again. -The one thing that appeals to me is this. -I've had it a long time. -You've had it a long time? -Some lady singing in church. -Yeah, but what do you do with it? -I just put it in the cupboard. when you get a whole lot of strange figures with wide open mouths. -I think they're great fun. -That would fetch in the region of £30 to £40. -But it is the most expensive thing on the table, I'm afraid. around about the Boer War time. he went to London, he had this bracelet made and gave it to her as a thank-you gift. -Do we know who this lord was? -No, I'm afraid I don't. she said, "When you can put it on your wrist, you can have it." It took me about six months to work it out. that you would ever see. It is a complete one-off, isn't it? -Can I ask you, as it took you so long to learn how to put it on, can I ask you to put it on? Certainly. You start with the head, hopefully, and you hold that there. -I'll put that in place there. -Then you wind it on. My goodness me! It's so articulated, it's not really like metal, is it? has got fatter and I can't fasten it now, but that's how it goes. and fits snugly into that hole in the body of the snake itself. Extraordinary. It really is a piece of Victorian practicality in a piece of jewellery. it's going to make in the region of about £800. I'm happy to see a fan any day, particularly a warm day like this. These are very interesting and those are stunning. -What colour would you call that? -Going from the pale down to the dark. -They look as if they've been taken from the Folies Bergeres. -What do you know about them? -Well, they came from my husband's side of the family, but that's all. And do you bring them out for special occasions? You waft around the garden on summer evenings? No, they live in the box, which is rather sad. I have to say I don't know much about cats, but I do know something about this artist, Henriette Ronner. She was the queen of the cat painters and I just love her work. and I think this is a superb portrait of, dare I say it, a bit of a moggy. But perhaps not - I don't want to offend every cat-lover in the land. -How did you come by this? -Well, it belonged to my grandparents. Originally, it belonged to Mary, Duchess of Bedford, the flying duchess. She was the lady that disappeared? -Didn't she, in her 70s, she took off in a Tiger Moth from here and was never seen again? and she of course never came back. should have a memento of their choice. My grandfather said he was taken to, I think, her room, allowed to pick something and he chose this. Her work has been in huge demand. -a lot of her clientele came from the aristocratic families of Great Britain. So that's a lovely tie-up with the Bedfords. ..in a tavern scene or something, they'd be seen skulking along. -that in the 19th century people had more leisure and more time on their hands. who catered for their rich patrons who wanted their cat or dog painted. and I just think it's wonderful to see her work. -I think if it was to be really, really valuable, it would have more detail in the background. -This cat would be on a sofa. or something like that - quite an interesting sort of idea. Now, what's it worth, that's the interesting question. -You've never had it insured or valued? Well, I think it's wonderful and her work is certainly collected. -I would say that if it came up for auction, it could make between £12,000 and £18,000. And I would insure it for perhaps £20,000. -So I hope that's a surprise, and what a wonderful, generous present from the Duchess. I've seen lots of punch bowls, but never with such decoration. It's been in my parents' household since the '40s. so whether it came from there originally, we're not sure. But where did it come from before it was in Longleat? I would think it's Chinese. The decoration on it is really remarkable. and then these scenes - the level of the enamelling in these landscapes is as good as you'll ever see. That's all gilding. The gilding is very, very good. It's Rococo gilding, exactly what you get in Europe at the time. -There is a problem - somebody bust it. -A picture dropped on it. I can't believe it! Anyway, it's been very well put together. Obviously, value has been grossly diminished, greatly diminished. 1800-1810, 1815 at the very latest. and I'm just going to tip it back slightly - just look at those feet. is typical of a maker called John Linnell. but it's by somebody who copied or admired his work and they've put this type of foot on. and then that particular brass foot, which is all original. And the value today, for insurance? -Lovely. I didn't think it was anything like that. Now here we have a Distinguished Service Medal to Frederick Burges - now, who was he? -He was the father of my son-in-law. Well, now, the interesting thing about it is that it's HMS Belfast, he served in the gun turrets. -And it was destroying the Scharnhorst - on the 26th December 1943. -This is real history, isn't it? -Because the Belfast - we still have one. -And that we can relate to. -She's still in the Thames. Something that you ought to take to the Belfast at some time and show the existing captain. Oh, right, I'll pass that message on. -are valued around about £500 to £800. I would go for the top figure, £800. -Thank you for bringing it in, it's great just to handle it. -and this is an oyster dish. So you could have your six oysters and your sauce, and this is a very standard majolica form. and so what this is, is a factory test piece where they've tried out and recorded various glazes. This is the biscuit, the single-fired, unglazed pottery. They've then put on the glazes. And this was regular factory practice. -But what is fascinating is that they rarely come out. and two, I've never seen a majolica test piece. I've seen hundreds of test pieces, but never a majolica piece. -And that's very much an American-driven market. and, to an American oyster-plate collector, this would be heaven. From your accent, you are French? -So, are you telling me they were bought in France? were very keen to import Chinese porcelain. throughout the 18th and especially the late 19th century. because they're in that style. They're in the famille rose style, to take a French phrase. The composition is basically flowering peonies. there's a symbolism here, which is marital bliss. but because we're looking at something from around about 1870, you'll find it is iridescent-free. because it's far from perfect porcelain. -So, I suppose it's a case of combien? I would say you're looking at the best part of £800, should you wish to replace them. Gosh! That's lovely. Thank you. -You can translate that into euros later. -That's very nice. Thank you. One of the most popular exports from Japan in the 19th century was bronze elephants. They really appealed to the Victorian mind. the Empire - and the elephant really epitomised that perfectly well. so this is the kind of scene they would have seen out there. -Where did yours come from? -This came from my father. -I don't know any more of its history than that. -And you've now got it? -Did you know it was Japanese? -Oriental was as far as you'd got. nobody else was capable of casting as well as this, at that time. They were absolute masters of it. it's a virtuoso bit of metalwork, really. But this is big, of its kind, and this is by a good maker. -And if we turn it up... Are these loose? I don't want them to drop off. ..Dai Nippon - which is Great Japan. casters of animal groups in the 19th century, and here we're looking at about 1880, something like that. I think this would easily make £3,000. It's probably been in our family for about 80-90 years. -It came from my great-grandmother to my grandmother. It bypassed my mother and came straight to me. It will become evident when you open the box why I inherited it. Well, I can't wait to open up. -Oh, isn't that absolutely beautiful? The first impression is a lot of attention to detail. -Look at this lovely scrollwork on the hatpin box here. Again, lovely condition, beautifully done. -And that's just pure chance? Well, cases like this were essential kit of ladies travelling in the 19th century. to keep all the perfume and the paste and powders and what have you, and they're nearly always silver. -It's got a series of marks here. TW for Thomas Weller. He was a specialist case maker and has a date letter "l" there for 1866.
and this sort of engraving is just what you would expect from a piece of that date. Very high quality, lovely condition. and one here, I see, has a push button. I've always wondered why that one's different. Well, that was to hold something of liquid and so it has a seal there. -The main thing is about these dressing sets is that the glass is not damaged. The more complete, the better. but basically, most of it is all here. It's actually quite rare to get one in a mother-of-pearl box like this. Normally they're made of coromandel wood with brass corners. I have to ask whether it's on your insurance valuation. -It's on the house insurance. I think you need to speak to your insurers. -Because I think you ought to have that insured for £8,000 or £9,000. Well, it is such a rare box, to have one so beautifully done like this. -Thank you so much for bringing it along. I was talking to a man here earlier at Woburn who is head verderer - he looks after all the deer. And he said that he likes it to rain every other day to keep the grass nice and sweet. I think it'll have to be tomorrow. It's been a scorcher here. 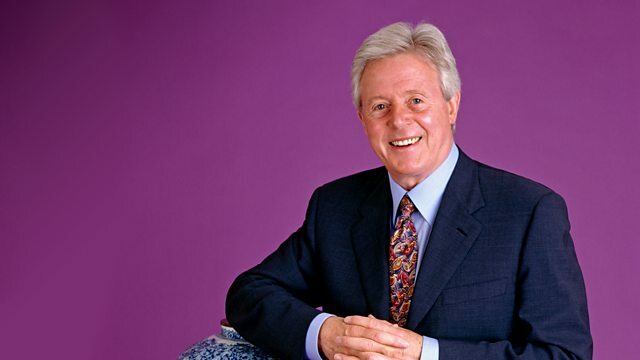 Michael Aspel and a team of experts invite members of the public to bring along their antiques for examination and information. The team visit one of the finest historic houses in England, Woburn Abbey in Bedfordshire. Treasured items brought to light include a rare washing bowl for beards, a portrait of a handsome cat valued at £18,000 and a Victorian bracelet that imitates a snake.